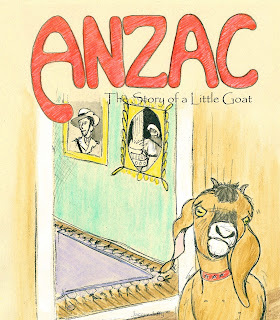 Anzac is an Australian story about a little goat. Won in a two-up game, his adorable Anzac eyes fail to win over the hearts of the cold family he comes to live with. In a case of ‘don’t judge a book by its cover,’ Little Anzac finds that the family he ultimately belongs with is very unlikely indeed. The story, set at a time where Australia is recovering from war, is heart-warming with its message and its lively illustrations will appeal to young children. Jacque Duffy, a fine artist and children’s writer of several books, is based in Cairns.